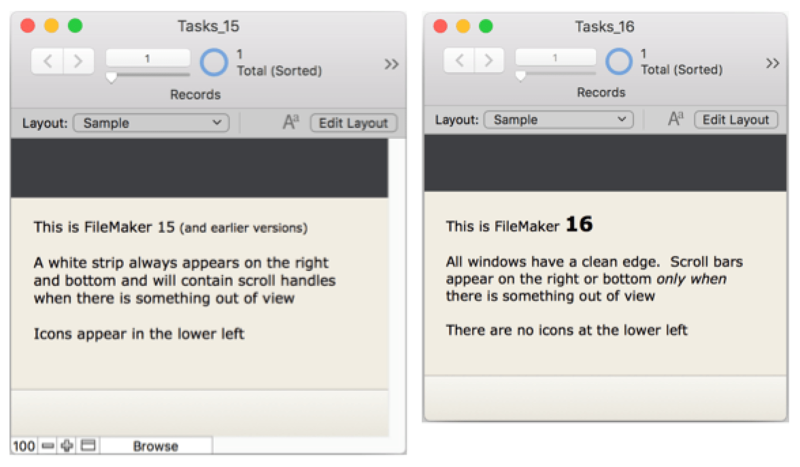 FileMaker 16 Features , version 16 will be a great place to start your journey down the road to user-friendly App development. If you already have experience developing with the FileMaker toolbox, don’t let this new version scare you. It’s still FileMaker! It’s still the simplicity that you know and love and won’t slow you down. The FM16 new feature list touts the addition of things like REST API, JSON functions, Tableau Web Data Connector, and enhanced cURL options. There will be other blog posts and instructional videos released on our FM News page that will help incorporate these technologies into your development if and when you need them. But what if you already have a solution that does what you need it to do, without all the integration? Will you still be able to make changes, add or modify layouts and scripts, and generally keep doing what you’ve always done in a familiar way? Absolutely! The most noticeable difference to the UI is that there is no longer a defined area on the right, or along the bottom, for a persistent scrollbar. Also, the icons in the lower left corner that changed Mode or Zoom level, and toggled the Status Area on and off have been removed. It’s a subtle change, but it creates a clean look that truly gives your solution a standalone “App” feel, and takes up less real estate. Getting used to a new version of software can often be intimidating. But with FileMaker 16 you can keep making great solutions and learn the new features at your own pace. If you’re new to the FileMaker Platform, version 16 will be a great place to start your journey down the road to user-friendly App development. If you already have experience developing with the FileMaker toolbox, don’t let this new version scare you. It’s still FileMaker! It’s still the simplicity that you know and love and won’t slow you down.